The Sousa Archives is sponsoring a special premier performance of Renée Bakers’ new film score composed for the newly discovered silent movie, Borderline, as part of this year’s Black History Month. Kenneth Macpherson’s visually compelling silent movie about interracial and LGBT relationships during the 1920s stars Paul and Eslanda Robeson, and the movie’s viewing will be accompanied by a live performance of Renée Bakers’ thirty-member Chicago Modern Orchestra Project ensemble using her newly composed movie score. Macpherson’s film is considered the last of the silent movie genre and was created well after movies with sound were the standard across America at the urging of Paul Robeson whose voice was continually earning him rave reviews for his music performances. His wife, Eslanda Robeson, who stars with him in this movie, attended the University of Illinois ca. 1912-1916 before transferring to New York’s Columbia University to earn a bachelors degree in chemistry in 1920. That same year she also met her future husband who was attending Columbia Law School. 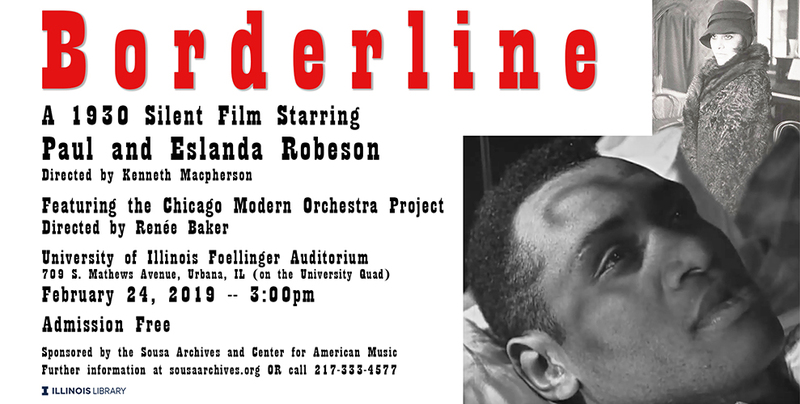 So this February’s special viewing of Borderline will also be a type of homecoming for Eslanda Robeson for the Urbana-Champaign community and the University of Illinois. Following the showing of the film there will be a 45-minute discussion with Renée Baker and the audience about her work on this movie and her continuing interest in reviving historical silent movies with her new film scores. For further information about this movie viewing and other events that the composer will be involved in during her stay on campus please contact the Sousa Archives and Center for American Music.